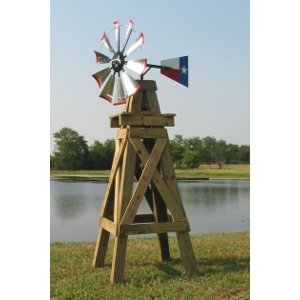 Lonestar 8' Windmill | Brazos Feed & Supply, Inc. Height: approximately 8 feet tall when measured from ground to top of fan. The blades, wire ring, and rudder are made from galvanized metal. The hub and bearing assembly is high quality and designed to last in an outdoor environment. One year warranty on all windmill heads, which covers against failure and breakage caused by manufacturing defects or parts wearing out. Rudder/ Tail - available as galvanized or Texas Flag design. Made with pressure treated lumber with mounting stakes included.